Well, I'm back with more strawberries. I can't seem to get enough of nature's ruby red gems...even in cookie form. I also get a kick out of this jar cookie cutter. It's just so fun! Don't these cookies just exude happiness? I don't know if it's the jars, the color combination of pink (pale) and red, or the tiny strawberries. Whatever it is, I like it. If you'd like to make your own jam jar cookies, now is the perfect time. These "preserves" won't be able to sit on a shelf in your basement (I don't have one) for a year, but no worries, they won't even last a day or two anyway once your friends and family get a hold of them. Roll out cookie dough. Use cutters to cut out jars and small round cookies. Bake cookies. Let cool. Make royal icing. Color most of it red, some of it pink, a small amount green, and leave some white. Using the pink icing and a number 3 tip, outline the "fabric" for the jar lids. Let dry for about 15 minutes. While pink outline dries, outline the mini, round cookies with the pink icing. Let dry for about 15 minutes. Fill the pink on the jar lids. While the pink is still wet, add polka dots to the pink icing (of the same consistency). Let dry for an hour, at least. Fill the mini cookies with pink icing and let dry completely. 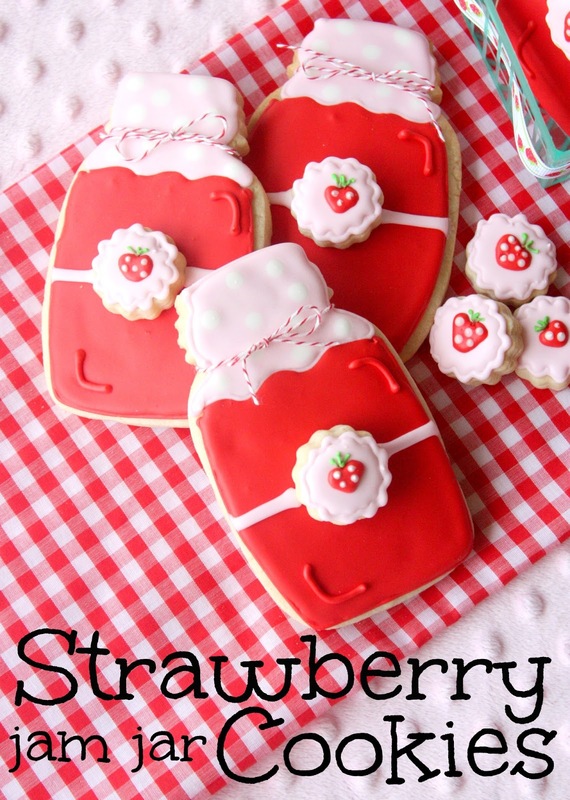 With the red icing make a small strawberry and add white dots (of the same consistency). Let dry for about 15 minutes and add the green leaf details. Let dry. Outline the body of the jar with the red icing using a #3 tip and let dry for about 15 minutes. Fill the cookies with the red icing. Let dry overnight. Add the red dimension details to the opposite "corners" of the jar. Put a dab of royal icing on the back of the round, mini cookie and place on the center of the jar. Add a "strip" of pink royal icing, starting from the center to the outer edge. Let dry completely. Using twine, tie a ribbon around the jar top and make a bow. The cuteness level here is over the top!!! You are so talented. They are too cute to eat! Loving all of the strawberries! These are adorable! I don't think I have ever seen a prettier Cookie Ever!!!! I found your cute blog on I'm Loving it Friday's! You have been pinned! How absolutely adorable! These cookies are beautiful and so perfectly done! Love the details, just beautiful! Just darling Sue! I love the red and pink together, adorable. Have a wonderful weekend! Yes, these cookies do look happy and they make me happy. 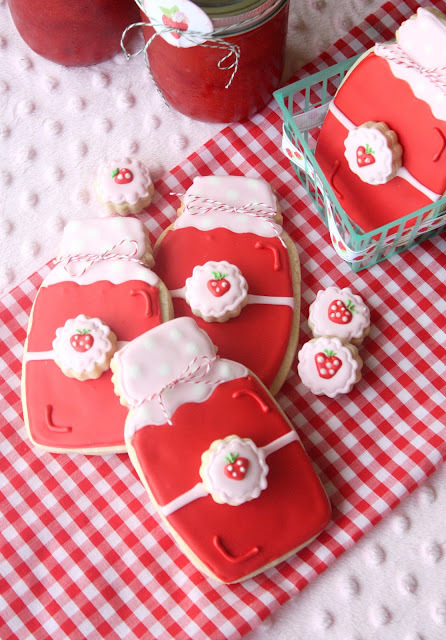 Love the little cookie with the teeny strawberry on the jar and that twine around the *neck* of the bottles...perfect! These look amazing! I love your icing skills! The perfect cookies for springtime! I would love to come hang out at your kitchen for a day and watch you (a master) create. What a treat that would be! So cute! These cookies would be adorable to take to a church luncheon. I can see why they wouldn't last! WOW! How darling are these? I love all things berries and jam this time of year. Thanks so much for sharing. I hope mine turn out as cute as yours. Have a wonderful weekend! Oh, what beautiful jar cookies! I love them! They wouldn't last 15 minutes around here, are you kidding? These are too stinkin cute, as always. I just love the little flower on the jar. Send some over! Your detail is just divine! Absolutely gorgeous cookies. 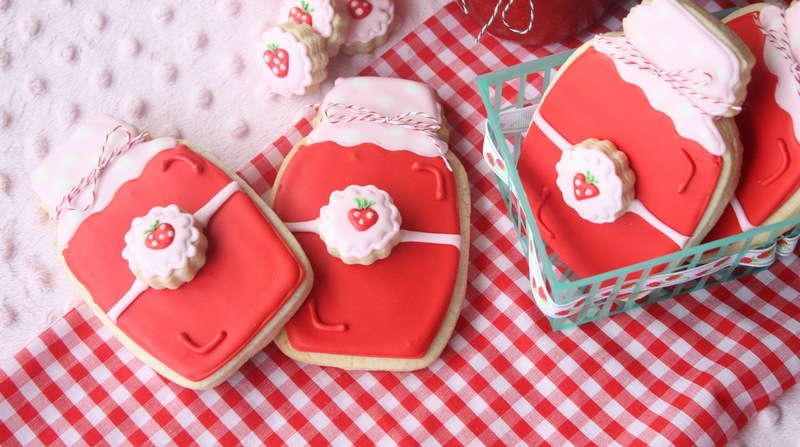 Sue I am seriously loving these strawberry themed cookies and the color combo of pale pink and red is beautiful. These are adorable and perfect for a Strawberry Shortcake party! Totally adorable! Being I am a total newbie,could you tell us where to buy this cookie cuter shape? Just beautiful work. I would love to make these. I purchased the jar cutter through coppergifts.com. Bow these are by far the cutest cookies, ever. Oh the cuteness! I heart it! Suzanne..it was so awesome to see you again! I've been in such 'blahh' blog phase aka 'my blahhg' that I wish I could splash a rainbow of paints all over it to liven it up. That said..I'm going to quote to you what my BF said upon seeing these and some of your other cookies. "Wow, she's the Rembrabdt of cookie decorating!" I feel exactly the same. These are SO beautiful - they look so much like strawberry jam jars that I'm craving strawberry jam this very moment! !